I was bought this as my daughter suffered terrible with reflux. It help during the day but was too big to fit in the Moses basket or even the carrycot of her pram. For this reason I feel we didn’t get our money’s worth. My baby had awful reflux since birth and is a bad sleeper as a result. We had weeks of rolling towels and trying cushions under his mattress with little success-baby couldn't sleep flat. I saw this on a support group discussion and my mum bought us one. We saw an immediate improvement in the quality of his sleep and his symptoms. In fact he hasn't vomited in his cot since we started using it two months ago. The design is very sensible with moveable velcro straps which hold baby in position for added reassurance. The downside to that is it makes using a sleeping bag impossible but we managed fine with cot blankets and as he was securely held I had no worries about him slipping down underneath them. The wedge was too wide for our moses basket but works fine in his crib and I know it will also help under the mattress when he is older when the inevitable colds and nasal congestion come along! The covers come off and can be easily washed. A little bit pricey but if you do have a refluxy baby it is worth every penny to ease their symptoms. Loved this product. My baby suffered from a lot of episodes of cold and this baby positioner was very helpful to relief his congested nose and made night time more settled. The Clevamama ClevaSleep+ elevates your baby to relieve discomfort from reflux, colic or nasal congestion and it helps with digestion. The adjustable straps allow you to position your baby most comfortably. 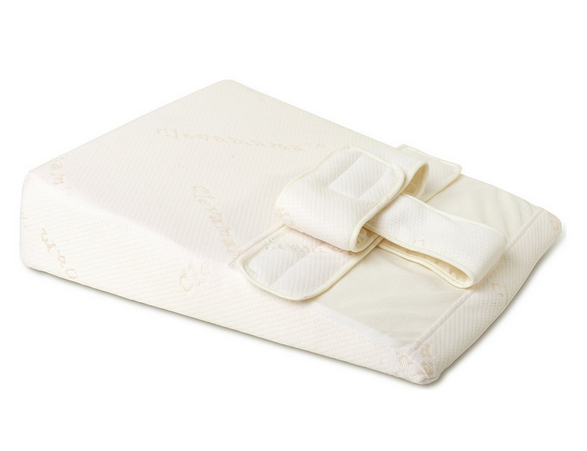 The ClevaSleep+ promotes a supine sleeping position to reduce the risk of SIDS and it protects the shape of your baby's soft head to help prevent Flat Head Syndrome (Plagiocephaly). Elevated to help relieve the effects of colic and reflux. Made using clevafoam® technology to help prevent flat head syndrome. Adjustable 3 point harness to grow with your baby. Promotes back to sleep resting position as recommended to help prevent sids. Not a member yet ? Join now! Join us now to write your own reviews and receive baby products to try FOR FREE!